Yesterday, the Government of New Brunswick (GNB) announced changes to provincial student financial aid, including the replacement of the Free Tuition Program & Tuition Relief for the Middle Class (FTP & TRMC) with a program called the “Renewed Tuition Bursary”. Despite the government describing this program as an expansion of FTP & TRMC for students attending private institutions, there are several implications of this new program that will negatively affect UNB students. The UNB Student Union strongly advocates for improved access to UNB education for low-income students and these recent changes hurt this accessibility. The introduced Renewed Tuition Bursary will supplement the federally funded Canada Student Grant (CSG) to a maximum of $3,000, instead of the $10,000 maximum that was previously provided by FTP & TRMC. For example, students will now receive a maximum of $6,000 when combining the CSG and the Renewed Tuition Bursary, whereas they previously could have received up to $13,000 under the old FTP & TRMC programs. The Renewed Tuition Bursary program will come into effect later this year, meaning that students returning to UNB in the fall who were relying on FTP & TRMC, will face financial barriers in a few short months. Additional changes announced yesterday by the provincial government include the abolishment of the Timely Completion Benefit and the reintroduction of the Tuition Tax Credit. The specific details of these additional changes are not clear yet and are still pending approval next January at the NB legislature. Your UNB Student Union, along with the New Brunswick Student Alliance, is currently actively communicating these concerns to the GNB Department of Post-Secondary Education, Training, and Labour (PETL). We will keep students updated through our website and social media on any major changes regarding this issue. To send a petition letter to the Minister of PETL directly, click here. We are happy to announce that the Harriet Irving Library will be open until 3:00 a.m. as of November 12th (from Sunday-Thursday). UNB Libraries and your Student Union are excited to share this announcement, that will enable provide a safe and welcoming space to study into the early hours of the morning! Our VP Internal Alison Balcom has worked especially hard on this initiative. We appreciate the Libraries ongoing commitment to student success and adapting to the needs of students in 2018. This announcement is particularly timely, as the hours begin just after the Fall Reading Week, a Student Union initiative by VP Internal Herbert Bempah two years ago. This year, we are focusing on our shared UNB story; what it means to be a University of New Brunswick student. Looking back at your time on this beautiful campus and remembering moments when you felt connected with not only your peers, but with our great university. The UNB Student Union has drafted an annual strategic plan that details all of the initiatives we will be undertaking throughout 2018-2019. This strategic plan is derived from the context of student life over the last few decades and drafted through years of talking to countless UNB students. For the first time, we are excited to share this annual plan with the UNB community. This year, we are delivering brand new large scale events, introducing new services, and delivering advocacy efforts that will benefit students. This plan has been created to make sure that everything that we connects to a greater vision and purpose: igniting engagement and spirit in the UNB student community. To read the entire plan, go to unbsu.ca/aboutus. Who Will be the Next UNB President? We are pleased to have our VP Internal, Ali Balcom, on the Joint Nominating Committee for the Office of the President. She will represent the student voice in a decision that shapes our campus. Our Executive Team has also met with the committee to ensure that we have a vibrant and energetic leader of our community. The committee wants to hear from you. Please complete this survey: https://bit.ly/2MhF458 to share your input and feedback on this important process. Last week our Vice President Advocacy, Simal Qureshi, travelled to Ottawa to attend the CASA (Canadian Alliance of Student Associations) Foundations Conference. CASA is a student-run, non-partisan and not-for profit student organization focused on improving post-secondary education through advocacy. This organization represents 22 student unions as member schools and approximately 270, 000 students across Canada. As an advocacy organization, CASA recognizes that successful lobbying starts with research and creating policy solutions that the government can then adopt to help solve common student issues. Therefore, CASA researches the problems students are facing and works with members to develop and review policies. When working on such policies to improve post-secondary education, CASA has four principles: innovation, quality, accessibility, and affordability. After developing policies, CASA presents them to influential people within government, such as Members of Parliament, Senators, and Ministers. Foundations was the first CASA conference for the new academic year and was primarily a learning conference. The conference was incredibly insightful for learning about CASA’s structure, governance, purpose, and history as an organization. Additionally, Foundations enabled members to have the opportunity to learn about government relations, policy development, advocacy training, and become familiar with several valuable organizations that hold potential for partnerships in the future. Finally, this conference provided valuable insight into how student organizations can work alongside each other to be effective advocates to the federal government. Simal Qureshi, VP Advocacy, and Richard Du, President, serve as the primary and secondary delegates, respectively, to CASA. This representation allows them to have the opportunity to sit in on CASA committees, such as National Advocacy, Federal Policy, and Member Relations. As a result, these UNB Student Union executives are responsible for sharing any updates on policies that are created and passed with UNB students. These students then have the opportunity to be involved in CASA initiatives such as the Get Out the Vote campaign, Sexual Violence Prevention campaigns, and Mental Health campaigns, for example. What's in store for Winter 2018! Check out all of our exciting Winter 2018 events, services and projects for UNB students. 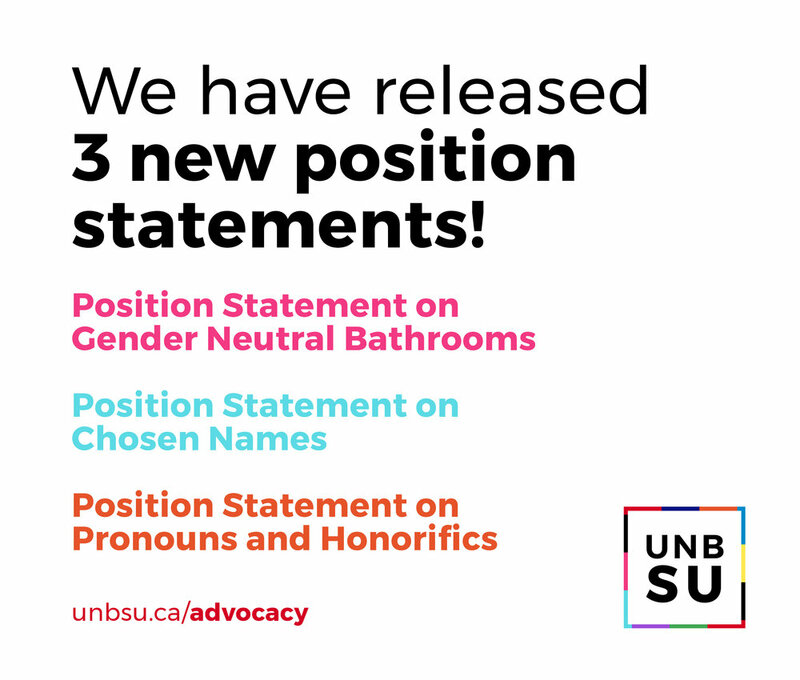 This morning, we released 3 new position statements on Gender Neutral Bathrooms, Chosen Names and Pronouns and Honorifics! We have a new look to serve you better! This is the UNB Student Union moving forward. We are hiring the REDs Organizing Committee! The UNBSU introduces the RED Awards! We are currently hiring 5 lead members for the RED Awards Organizing Committee! The RED Awards is the first annual awards ceremony hosted by the Student Union to highlight and celebrate remarkable individuals and associations in the UNB community. This awards program is a community choice award that seeks to celebrate student engagement and positive impact by both students and staff on campus. The UNB Student Union is proud to announce the expansion of their SafeRide program. The expansion includes, not only a new van, making it a fleet of three, but a new partnership with the NBCCD Student Alliance, increasing the amount of students served. This expansion will ultimately allow the SafeRide program to reach for students and provide this quality service in addition to an amazing part-time job opportunity. This is a letter written by Shea MacLaughlin, the UNB Student Union's Women's Representative. The UNB Fredericton campus is fortunate to be hosting the Women for 50% Conference. This event was organized by a group of New Brunswick leaders for the purpose on shedding light on the need for greater female representation in the legislature, and with the additional aim of actually encouraging more women to run for office. The topic of women’s representation isn’t just important on a provincial scale but also at a UNBSU scale. The incoming council is 40% women, which isn’t bad but there is still work to be done. In a society where women continue to be underrepresented in leadership roles in many fields, the importance of events like this cannot be understated. There are many myths and misconceptions about why women are underrepresented in leadership roles, with some arguing that women simply do not want leadership roles, with others believing that women are not qualified to be leaders. These beliefs are not only sexist, but also hint at deep seeded prejudices towards women and female leaders. The reality is that there are more complex barriers that prevent women from attaining leadership positions or running for office. Some of these reasons include the fact that women are still responsible for most of the household labour, and that women are less likely to be encouraged to take on leadership positions. Additionally, the aforementioned gender biases mean that female leaders women are forced to contend with double standards for their behaviour, meaning that they have to ensure they display a stoic and tough leadership style while simultaneously receiving backlash for being too tough. There are steps that can and must be taken to disrupt the status quo and promote the value of female leaders, in society and on a UNBSU level. To begin, we need to actively seek out and empower women to occupy leadership positions. The UNBSU can cooperate more closely with groups that serve women on this campus, groups like Women in Engineering, or have a stronger partnership with the UNB/STU Women’s Center. Education on the value of women in leadership positions must also occur, and it must be made clear that having women in leadership positions is an essential step in creating a more inclusive, equal, and balanced society. These are only a few suggestions, but the key takeaway is this: the promotion of female leadership is not solely a women’s issue. It is everyone’s responsibility to champion the value and role of female leaders, and to do their part to help build a more equitable society.